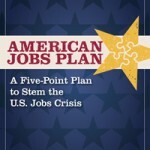 Jobs for America Now is not content to just call for job creation, members of our coalition have developed ambitious, yet achievable plans for generating millions of jobs in 2010. Here are some resources that offer a blueprint to guide policy-makers in easing the worst jobs crisis since the Great Depression. The United States is experiencing its worst jobs crisis since the Great Depression. (See Jobs Crisis Fact Sheet.) Nearly 16 million Americans—our family, friends, and neighbors—are out of work. This national crisis demands a bold plan to put people back to work. The Economic Policy Institute proposes the American Jobs Plan, a plan that would create at least 4.6 million jobs in one year. For America’s workers, three words say it all: jobs, jobs, jobs. The AFL-CIO has a jobs plan, and it’s time for Congress and the White House to act. Our five-point plan for immediate job creation includes increasing aid to state and local governments to prevent layoffs and maintain vital services, creating jobs by repairing and building infrastructure, and putting TARP funds to work on Main Street, not Wall Street. A central component of the coalition’s 5-point plan is direct job creation through the public sector. The Community Jobs Program developed by the Center for Community Change and other coalition partners puts $40 billion in federal investment to work rebuilding communities and restoring dignity to families. The National Urban League 6-Point Plan for Job Creation directly addresses the dire need for jobs, job training, business investment and homeowner interventions in urban communities across the country experiencing chronic rates of unemployment.